Upper Michigan 79 Acre Ontonagon County Homestead for sale. 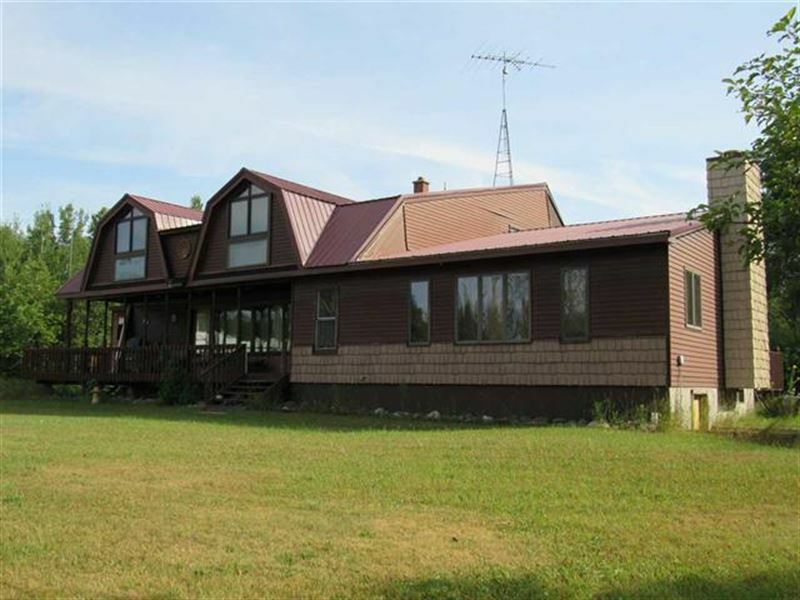 This property is located four miles south of historic Bruce Crossing, in southern Ontonagon County in the Upper Peninsula of Michigan. In 1845 an overland mail route was established from Fort Howard in Green Bay, Wisconsin through Bruce Crossing, to Fort Williams at Copper Harbor. It became a nationally designated wagon route, known as the Military Road. Road work began in 1863, and a small relay station built in 1868 became the birth of Bruce Crossing. Logging companies and camps followed construction of the road. In the 1880S The Diamond Match Company obtained timber rights in the region and built some of the earliest camps. Railroads reached the area by the late 1880S. With the founding and operation of the many sawmills along the banks of the Baltimore and Clear Rivers, Bruce Crossing took on a sense of permanence. The first permanent structure was the Donald Bruce hotel, store, and saloon, constructed in 1886. The community was officially named Bruces Crossing after the first postmaster, when its post office opened in 1888. It was shortened to Bruce Crossing in 1891. By 1907, Bruce Crossing boasted two stores and two saloons. Farming and Logging coexisted in the area. Men working in the logging camps harvested timber during the winter months, and returned to their farms in the summer. Agriculture and lumber industries continued to dominate the communities, with tourism now the mainstay. The property offered for sale has a tributary of the Baltimore River crossing it. The Baltimore River is a 33.6-Mile-Long river which hosts good fishing for Brookies, Browns, and even Rainbow trout. The O Kun de Kun Falls and the Peanut Butter Falls are located on the river. It flows into the Middle Branch of the Ontonagon River, a good Trout and Salmon angling river, and then into Lake Superior. Lake Superior in this area has wide sandy beaches for boating, swimming and fishing. Brown trout, Coho and Chinook salmon, Lake trout, Steelhead and Whitefish are available in Lake Superior. To the south-east of the property is access to Ottawa National Forest Lands. Whitetail deer, Black bear, and Grouse hunting is excellent in this area. Access to Snowmobile Trail No. 3 is just down the road. The Main home was built in 1. It features a Main Floor Living Room, Dining Area, Kitchen, First-Floor Bedroom and Full Bath. A large Covered Porch surrounds the front and side of this area. In 2005 a 24x24 Family Room was added, and this room has a sliding glass door that opens to a private Back Deck. Upstairs are two Bedrooms, another Full Bath, and 486-Square Feet of unfinished Loft Space that could provide extra Bunk Room space, or space for doing crafting or studying. The Upstairs bedrooms have large sliding glass doors that lead to an Open Deck that is the full length of the home. Many upgrades have been made: 2005 aluminum siding, 2010 metal roof, 2010 custom Andersen wood Low-E windows in some rooms, 2010 central air, 2014 refrigerator, 2014 water heater. Four outbuildings are included: A 32x48 Pole Barn with 220-Power, and attached 30x60 fenced Kennel. A 30x42 Pole Barn with poured concrete floor and power. A 32x66 Pole Barn (formerly an Antique Shop), with poured concrete floor, power, and attic space accessed by pull-down stairs. A 10x20 Shed for storage. The groomed yard features a 2,000 pound bronze front lawn ornament created out of a scupper downspout, by Petro Lazzeri. The 80 Acres is made up of the Front-40 with sandy loam soil on which potatoes and vegetables have been grown, and the back 40 Acres which is wooded and has three blinds for deer hunting. Game animals on the on the land also include wild turkey, partridge, and rabbits. This property would be great for a large family, or would make a great Clubhouse for a group of vacationers. Contact us for a private tour today.